Do you need space for meet-ups? Come on! Do you need a space to share your knowledge with others? Would you like to host a Meetup? Then, Come on to Commons Ground! 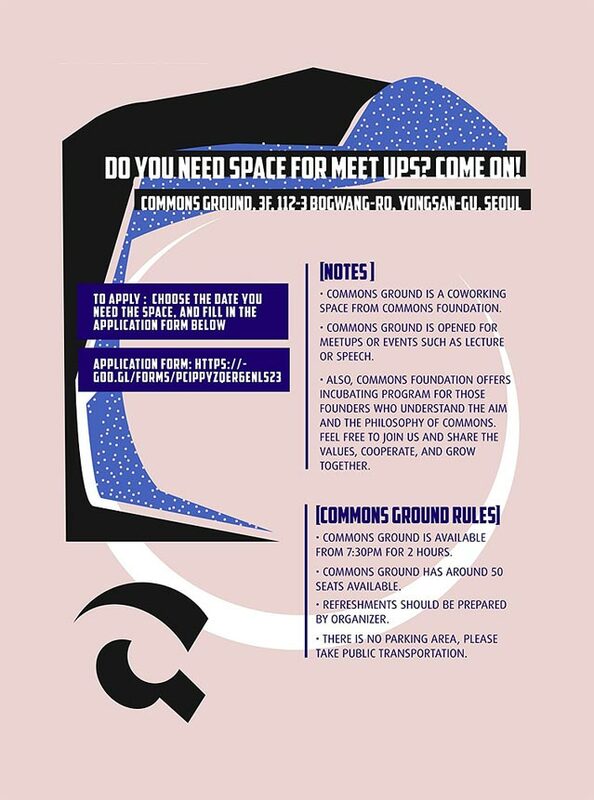 Commons Ground is opened for meetups or events such as lecture or speech. If you have a nice idea for Meetup, always welcome. Host a meetup right now! Homepage : https://ground.commons.foundation Application form : https://goo.gl/forms/pCiPpYzQEr6eNLs23 *Commons Incubating Program 'CIGGU'* - Commons Foundation supports necessary resource to those founders who understand the aim and the philosophy of Commons. - The community made by themselves creates ecological system of Commons, sustain by themselves and reach their own business goals and contribute to the community. - If you are interested in Commons Incubating Program, feel free to contact us : hello@commons.foundation.